If you’re an online retailer looking to enhance your reach, a simple Google Ads campaign might not cut it. To get your products in front of the eyes of eager shoppers, you should consider embarking on a Google Shopping Campaign. So, what are Google Shopping Campaigns and how can you maximize their results? Let’s take a look at some top examples you can copy now to get a jumpstart! Google Shopping Campaigns (also known as a Product Listing Ad) have become the backbone of several successful retail advertising campaigns throughout the years. By putting your products right at the top of their SERP. No digging around SERP results. No hunting through product pages. Just shopping. So it’s no wonder they work. They give your customers an opportunity to see your product and its price early on in the buyer’s journey. This gives you the opportunity to rake in conversions straight from the SERP. But, the secret is out, and Google Shopping Ads have become very popular in the retail sector. A Google Shopping Ad is a product listing advertisement that showcases your product with its price and photo. You can also add promotional price points, reviews, and more to increase conversions. Google Shopping Ads show up before organic or paid search listings. So you see them first thing on the page. Shopping ads are a different breed of ad, though. For starters, unlike with Google Display and Search Ads, there’s no keyword bidding when you’re running a shopping ad. That’s not to say there’s no bidding at all. Instead of trying to rank for keywords, bids are set on a product category. Each ad is based on individual product feeds, which are kept in Google’s Merchant Center. In the beginning, this was enough. But that all changed between 2017 and 2018, when the level of competition for Google Shopping Ads became abundantly clear. Ad spend rose 17.85% with the average cost per click going up 6.67%, making Google Shopping Ads one of the fiercest battlegrounds in the marketing world. That’s why you can’t fly into a Google Shopping Ads campaigns half-cocked. Let’s take a look at some top examples you can copy and then dive deep into how to properly run your campaign. 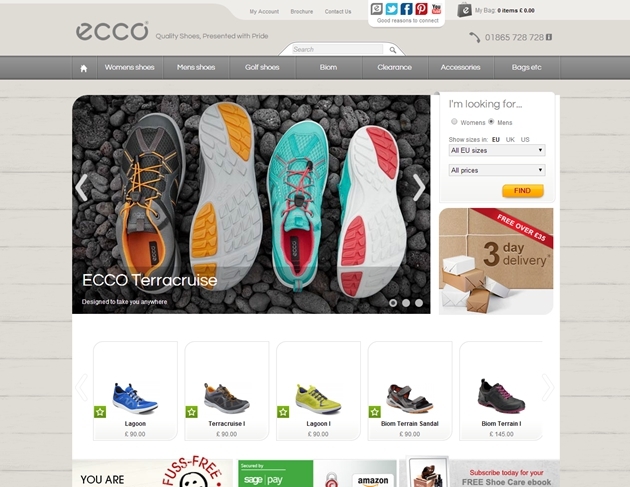 This ECCO shoe and accessories store primarily profits from their physical location in Oxford and their ecommerce store. Footwear is a difficult industry to make a mark in, with large retailers like Reebok and Nike controlling most of the money. To properly counteract this competition, ECCO Oxford needed to target its ads properly and be seen by the right people. The other issue was an extraordinarily high cost per acquisition that ate into their profit margin. By pushing a percentage of their marketing budget into product listing ads, ECCO Oxford was able to build a targeting strategy. They spent a lot of time optimizing their product feed and then focused their targeting efforts on finding the best traffic for the lowest price. But once the plan was in place, it had to be maintained. This is not a set-it-and-forget-it deal. Activity was constantly adapted to fit with an evolving product range. They also had to swap out products as the year went on in order to keep updated with the seasons and fashions. Using this strategy, they were able to increase their new visits by 24%. Cost per conversion came down by 14%. Overall conversion rate increased to 28%. And the average value of an order increased by 38%. Paper Culture is a stationery company that is concerned with environmental issues. All of their products are 100% post-consumer recycled. “One of the toughest challenges for us as a small business is that we don’t have the brand of our larger competitors,” Chris Wu, the CEO, and co-founder of Paper Culture said to Google. Paper Culture turned to Google Shopping Ads as a way to complement their existing Adwords campaign. Paper Culture combined the image-centric approach of Google Shopping with customer intent. By targeting effectively, they ensured that they were reaching qualified leads. Result? Paper Culture increased their ROI 3x compared to other channels. They also saw a decrease in their cost per lead by up to 50%. TravelSmith Outfitters is a company with a mission to make travel easier and more enjoyable. TravelSmith’s strategy involved converting shoppers with offers that sweetened the deal. And it was hugely successful. They saw an overall ROAS increase of more than 20%. Their Google Shopping sales growth increased by over 200%, with approximately 4,000% year-over-year growth as a result of these Google Shopping Ads. And orders were increased by 35% with a 26% increase in conversions. Now that you’ve seen how effective a Google Shopping Campaign can be, it’s time to determine how best to harness that power. In order to be effective, you have to optimize the shopping feed. It was key with ECCO Oxford’s success. Your shopping feed is a list of products you have for sale which communicates the available inventory to Google’s advertising channel. This feed data is then cross-referenced with both the searches of individual shoppers and your bid. (Because money still matters.) And all of this determines where you fall. The Product feed has the single greatest effect on the performance of a campaign. That’s why getting the optimization right is so important. Another key to the optimization of a Google Shopping campaign is segmentation. This is a lot like a search or display campaign in some regards. You need to make sure your marketing dollars aren’t being wasted by irrelevant searches. Adding negative keywords helps narrow down your searches, weeding out some of those worthless clicks that eat up ad spend like Pac Man at a dot buffet. This gives you more control over what your products show up for. By segmenting you create an opportunity to appear in Google’s Shopping Funnel for the right people. Bidding is obviously an important part of the Google Shopping Ads process. You have to spend money to make money, right? When it comes to bidding on shopping ads, strategies can be either automated or based on a number of preset rules. Automated bids are useful when you’re running simultaneous campaigns. Because Google’s AI learns as it goes and sets bids that are optimized to reach certain criteria outlined in your marketing objectives. For example, you could set your bids to maximize clicks within a targeted ad spend. This could also help you increase engagement for products that are historically suffering from low traffic. There’s also an Enhanced Cost per Click automated strategy. This adjusts the manual bid, either higher or lower, depending on the user’s likelihood of conversion. This strategy allows you to control your bids manually while still increasing conversions. Automated bidding can even aim to hit a targeted return on ad spend. This strategy maximizes the bid amount to coincide with conversion values in order to try and reach a targeted return. A targeted return on ad spend strategy helps you get the best conversion value possible while still meeting your targeted return numbers. On the other side of the coin, rule-based bidding allows you to set specifications on ROI, trends, conversions, and impressions. This strategy is popular because it’s more transparent. Advertisers can actually see which rules are working and which are wasteful. And adjustments can be made to maximize your marketing budget. Like all other Google Ad campaigns, Google Shopping Ads can be highly targeted. In fact, targeting is essential to success, as you saw in our examples. When targeting shopping ads, you can specifically target new visitors who have shown similar search behaviors as your existing customers. This maximizes existing customer data to reach new people with the same messaging that has proven to work in the past. When utilizing a similar audiences approach, audience targeting becomes simplified because you’re no longer guessing when setting up your target audience. You know what you’re looking for from the get-go. Similar Audiences pairs well with remarketing campaigns to cast a wider net of people who have interacted with your product and people who have not. Google’s customer match targeting strategy gives you the chance to personalize campaigns for your audience. You do this by uploading promotional email lists and existing customer data to Google Ads. Google’s customer match can be used to tailor specific messaging to segments of the audience. This is great for upselling and cross-selling campaigns, while also giving a needed boost to brand loyalty. It can also help you reach people who have abandoned their virtual shopping carts. Geotargeting is also available and useful. Your bid percentages can be changed based on the location of a customer. You can also base region targeting off of performance goals. For example, mobile ads can be targeted to customers who are in close proximity to physical stores. These should have a redeemable element that can be used when a customer visits. Try to be as specific as you can with the region. Targeting the entire world or even the entire US can be way too broad, which leads to wasted ad spending. Narrow down by zip codes or even a radius around a location to get super specific. Geotargeting gets even more advanced and useful when you include negative areas for places you don’t want your ads to show in. This works exactly like negative keywords. Google Shopping Ads are a great way to boost your existing promotions, and promotions are a great way to make your Google Shopping Ads more effective. Highlighting a special sale where a certain percentage is taken off of the price instantly draws eyes. Even listing something as a “Special Offer” can go a long way toward standing out in a crowd of competitors. When users mouse over the special offer, they see all the details (including a promo code if applicable). This is akin to sending the customer a personalized coupon. What’s more, there is no extra charge for including promotions in your ads, so it makes perfect sense to go for it. If you’re an online retailer not utilizing the power of Google Shopping Campaigns, you’re missing out. Never before has there been such an effective way to get your product in front of such a targeted audience. But before you jump in, make sure that you have a set plan in place and are targeting your audience properly with the most effective bidding strategy. Arm yourself with information and you’ll create a Google Shopping Campaign that will skyrocket your products to the next level in terms of brand awareness, loyalty, and conversions. Thanks for these wonderful insights about google shopping ads campaigns.